What happens when chocolate meets funfetti. It’s midterm season, and there is one thing I crave more than anything during test prep: chocolate chip cookies. My friends all seem to go nuts over funfetti cupcakes, even though they’re not my favorite. Luckily, I stumbled upon one recipe that combines these two classic flavors that almost everyone loves. 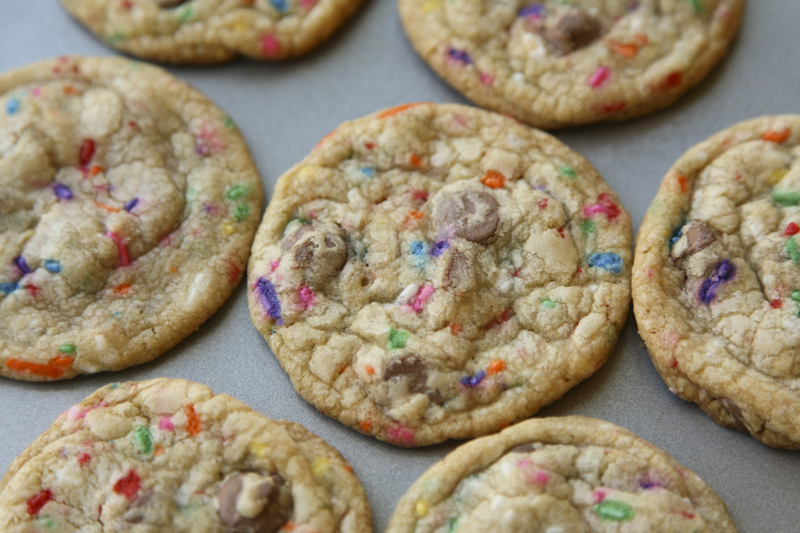 So what happens when a chocolate chip cookie meets funfetti cake? You end up with chewy cookies exploding with chocolate, sprinkles and lots of sugary goodness. 1. In a mixing bowl, combine flour, vanilla cake mix and baking soda. 2. In another large mixing bowl, cream the butter and sugar together. Add the egg and vanilla to the mixture and stir until creamy. 3. Add the dry ingredients to the wet ingredients, and mix until well-combined. 4. 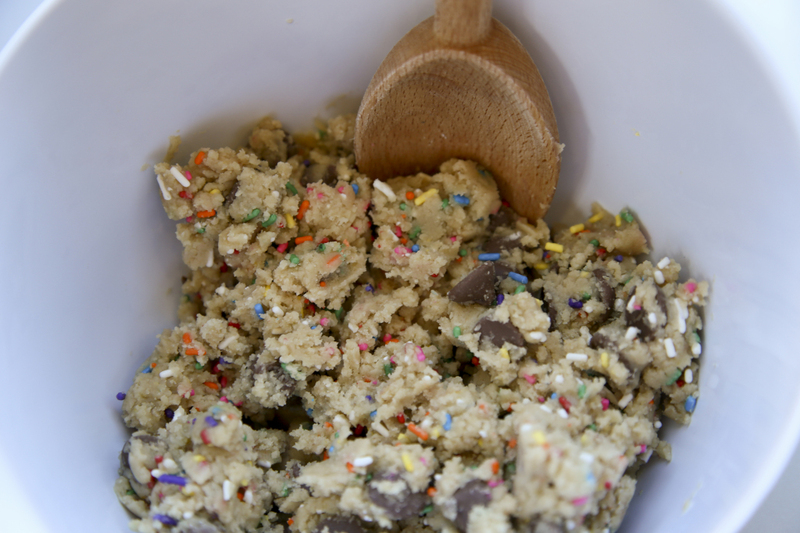 Fold in the chocolate chips and sprinkles. Be careful not to over mix it! Otherwise you will crush the sprinkles and risk turning the dough a funky shade of green. 5. Next, chill the dough for two hours in the fridge (otherwise the cookies will spread too thin in the oven). If you’re as impatient as I am, about 20 minutes in the freezer should do the trick. The dough can also be frozen for up to 3 months if you want to save it for later! 6. 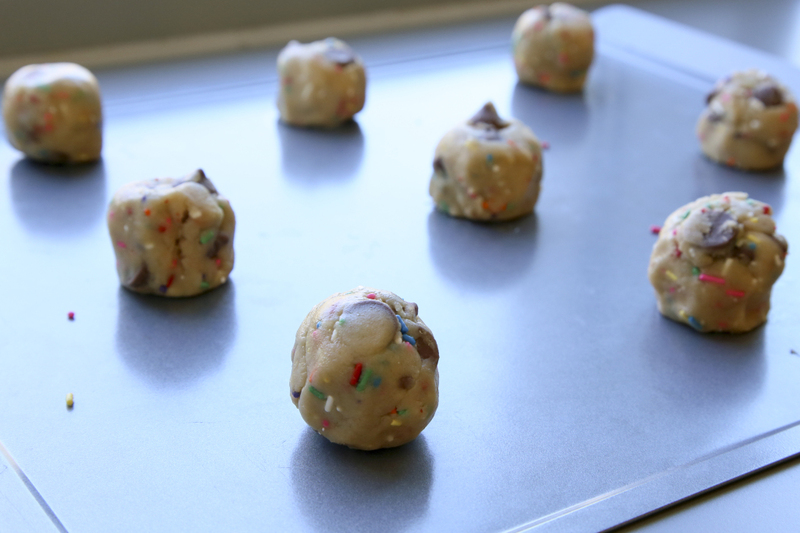 While the dough is chilling, preheat your oven to 350°F and get out two cookie sheets. 7. Take the dough out of the fridge or freezer and roll it into balls of about 2 tablespoons of dough. If you want to make them look extra fancy, use a few extra chocolate chips to press onto the top of the cookies. 8. Let cookies bake for 10 to 12 minutes. If you want them a little more done, leave them in for 12 until they get brown on the edges. Be careful though, because the bottoms of the cookies burn easily! 9. Take them out of the oven and let cool for 2 to 4 minutes before taking them off the cookie sheet. After removing them from the cookie sheet, they should take about 10 minutes to cool. 10. Now enjoy your delightful chocolate chip and funfetti cookie combo! They are guaranteed to satisfy any and all midterm cookie cravings.